The other day I was reading about someone who was tired of their winter vegetables. She was saying something about San Diego’s winter vegetables being tired and pale. I can’t think of anything that is further from the truth. Just last week I got crisp cauliflower, yukon gold potatoes, and the greenest sugar snap peas I’ve seen all winter. 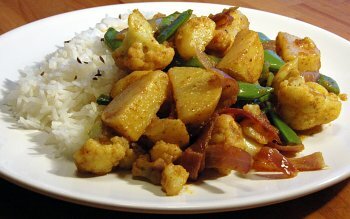 With all these delicious winter vegetables, I thought I’d put together my version of the Indian classic, Aloo Gobi. This recipe is pretty straight-forward, no fancy techniques, no fancy ingredients. You may even have all these boring ingredients in your pantry already. Boil potatoes, skin on, until fork-tender. Remove potatoes and rinse under cold water while peeling the skin off. Chop potatoes and reserve. Blanch cauliflower in the potato water for 2-3 minutes. It should still be firm. In a large, dry skillet toast the curry powder until fragent. Add the oil and saute the onions until translucent. Add cauliflower, potatoes, peas, and butter and stir continuosly until all the vegetables are coated with the curried oil. Cook for 1-2 more minutes. Season with red pepper and salt and pepper to taste. Serve with steamed long-grain rice. Thanks for the information. Its good to see that there is some great information on the web. I have a site http://www.kristufa.co.cc not to sure what I want to blog about yet tho. Since I live in New England, I can’t imagine getting fresh local “winter” veggies! We have signed up for a CSA for the summer, though — you guys inspired us! nothing is boring when you saute it in butter and add some curry powder! i have a question to pose for you jef. what do you think are some of the best, not outrageously priced, restaurants in the SD area? you’re from here right? and i know you’ve got good taste in food… except maybe burgers 😉 i’m interested to know, we need some new dining out ideas! I don’t really have much fear about running out of green things. Seabreeze CSA pretty much keeps the greens coming all summer long. Pickled beets…that could be a good idea. I have about a dozen of them with no plans. I know exactly what you mean. All the new spring produce has me pre-nostalgically buying the winter greens before they run out.